Constans as Augustus. AD 337 to 350. AE 1/2 Centenionalis. Denomination : AE half centenionalis. Mint : Only parts of the mint mark are visible, and I am not 100% certain, it appears to be ALE for Alexandria in Egypt. Date : issue of AD 348 to 350. Size : 15.7 x 17.1 mm Weight : 2.39 grams. Grade : VF with a dark green patina. 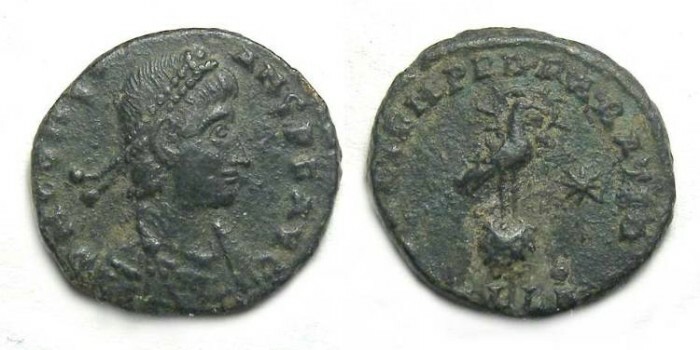 Obverse : Head of Constans right, with DN CONSTANS P F AVG around. Reverse : Phoenix standing right on a globe, with a star in the right field, with FEL TEMP REPARATIO around, with a mint mark in part off the flan below.